A few weeks ago Laura King (@DrLauraKing), one of the Family Archive project team, tweeted a link to a piece in the Guardian by Kathryn Hughes ‘Our homes are cleared but we still crave tat’ (09.03.15). According to the article, we appear to be becoming less and less sentimental about hanging on to objects, particularly the stuff which doesn’t support our own ‘curated’ view of ourselves. This got me thinking about whether this sense of ‘de-cluttering’ applies to the family archive too? (NB: with the caveat in mind that we have yet to fully explore what is meant by a ‘family archive’ yet, this will be one of the aims of the focus groups taking place in a few months’ time). Is there a point when curating a sense of family identity via material objects become a burden? When we are literally weighed down with stuff that it can be difficult to make sense of the objects before us and the stories that they tell. Museums and heritage sites face this issue all the time, particularly sites which care for the possessions of collectors and enthusiasts. A good example of this is Tyntesfield House. When the National Trust took ownership of the house in 2002 it was bursting at the seams with over 50,000 possessions from across four generations of the Gibbs family, including gun cases and archival documents to more mundane items such as fishing equipment, shoes and plastic bags. You can see the collection here. But it isn’t just the homes of the wealthy that are crammed full of stuff, the J.W. 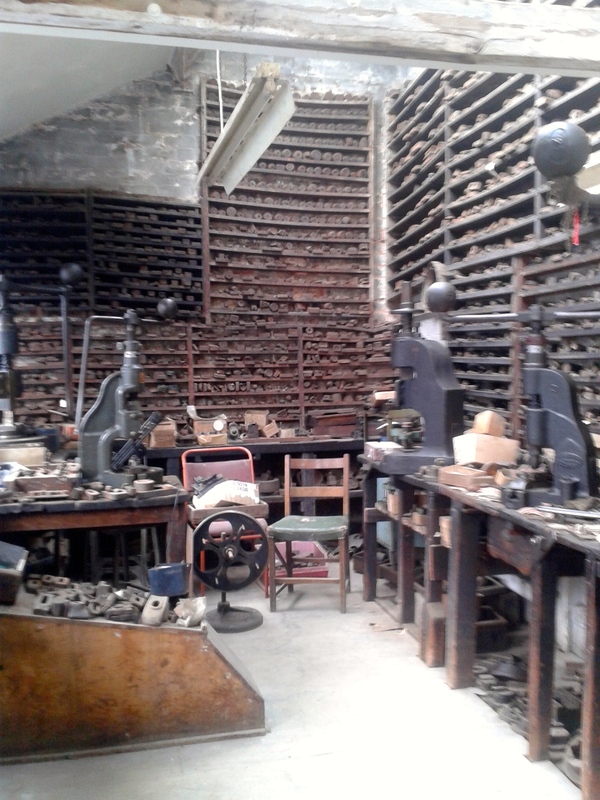 Evans Silver Factory in Birmingham is an example of the material and paper archive of a family business presented as though the workers have downed tools, popped out for lunch and could return at any moment (see below). While accredited museums follow guidelines around the disposal of objects, the family archivist may not have a ready set of guiding principles at hand. Aside from any legal processes which may come in to play, how do families deal with a lifetime’s accumulation of stuff passed down to them when a loved one dies? Does someone else’s stuff become a burden? How are decisions made about what to keep and what to dispose of? 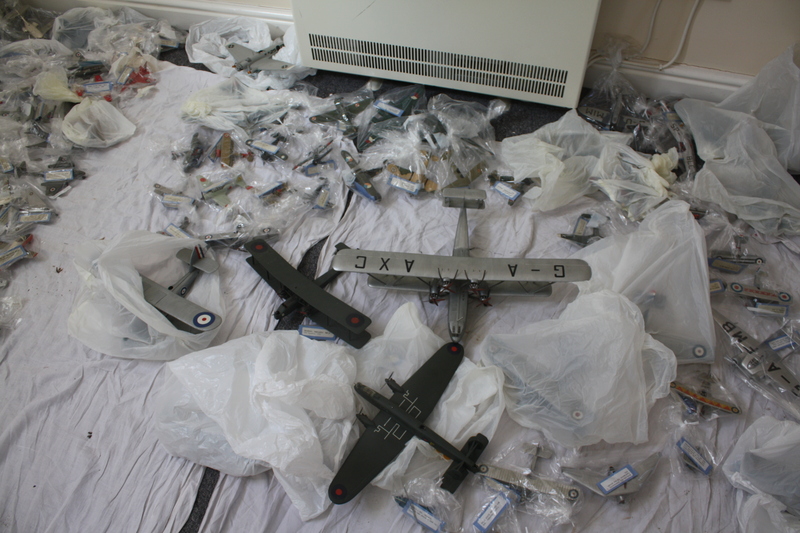 A good example that I recently became aware of is Vic White’s collection of handmade model aircraft which totalled 1400 at its peak. When Vic passed away, Roger, one of his sons, eventually realised that the collection could not be kept in storage indefinitely. Apart from the ongoing financial burden, the collection needed a new home. Vic’s collection was of interest to model aircraft enthusiasts, and the conclusion reached that different parts of the collection should either be sold or donated. However, not all of the collection was dealt with in this way as some examples were retained by family members for the memories that they evoked. The process of deciding which ones to keep and which to sell/donate was far from an easy, and was at times distressing as some models had become damaged or were missing entirely. For Roger, his father’s models, which were now integrated with the models he already owned plus examples he made with his own son, arguably represent the continuity of a shared family interest between fathers and their sons that has continued over several generations. Some of the Victor White Collection, laid out for inspection by an auctioneer. The collection all at 1:72 scale, was made by Victor White and his son Roger. They were on public display at Salisbury Hall, Hertfordshire (now De Havilland Aircraft Museum) and then Fort Regent, Jersey between 1976-1990 when they went into permanent storage. The remnants of the collection were sold to the International Plastic Modeler Society in 2013 to contribute to the National Model Aircraft Collection. In a way Vic White’s collection is less typical because the models have national importance, whereas the majority of accumulations of personal possessions probably won’t have this wider meaning. However, the approach to dealing with them is arguably struggle between pragmatism and emotional attachment which I suspect will resonate with many. It will be interesting to see if any of our focus group participants will share similar stories. Hi Tess, thank you for your comment. Your Dad’s collection sounds more and more extraordinary the more I learn about it!